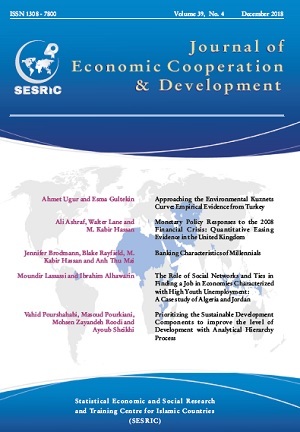 The selection of these articles in this issue of the Journal of Economic Cooperation and Development – December 2018 – based on the theme on ‘Finance and People’ - gives a prospect for the new trend of the exchanges of knowledge and information among and outside the OIC countries. While environmental factors and economic growth within the context of adaptation to the environment provides a new look of how an economy can be curved, the characteristics of the Millennial generation along with their mastery of social media networks influence the banking sector by matter of interest in and utilization of financial products and services typically offered by banks and help these people find employment as well. By opening a window to various scholars, researchers and academics within and outside the OIC region to continue demonstrating an increased interest in sharing their valuable works and studies with the readers of our Journal of Economic Cooperation and Development, SESRIC is proud to share the valuable information in these articles with the OIC Member countries to provide them with a chance to keep up with the pace of the changes occurring in the world economy. This December issue contains five noteworthy articles which accentuate a detailed analysis of environment vs. economic growth, monetary policy, banking, social media and employment as well as sustainable development. The first article investigates the important relationship between environmental factors and economic growth within the context of adaptation to the environment. The generation of Kuznets curve based on the original Kuznets (1995) curve for Turkey’s economy for the period 1960–2011, using the carbon dioxide emissions, energy consumption and per capita GDP variables helped obtain results parallel to the Kuznets curve for Turkey’s economy and the reverse approach was accepted and the structural break analyzes applied in the study are important in terms of Turkey's economy. The second article analyzes responses to monetary policy tools during the United Kingdom’s Quantitative Easing regime from March 06, 2009 to June 02, 2010 on a set of target variables: market index, foreign exchange index, investment grade and non-investment grade bond yield, and spots and forwards of different maturities for OIS, LIBOR and Nominal Government Yield. Results suggest that conventional monetary policy tools other than a zero-bound official bank rate may still be effective. Inclusion of one unconventional tool, the increase in government gilt holdings, has significant impact on most of the target variables. The third article looks at the characteristics of the Millennial generation, compares them to other generations, and explores how the characteristics of Millennials influence their banking behavior, specifically their choice to utilize financial products and services commonly associated with financial institutions. The results indicate that Millennials differ from Generation X and Baby Boomers in several aspects, including utilization of mobile banking, accumulation of student loan debt, and perception of financial knowledge. Through differences in means tests and probit regression, this study reflects how these factors influence Millennials’ interest in and utilization of financial products and services typically offered by banks. The fourth article shows that social networks and ties play an important role in labor market intermediation in Arab countries. In addition to descriptive analysis, we utilize binary probit regressions to investigate determinants of the probability of finding a job through social contacts. The study finds that social networks are a popular method to find a job in Algeria and Jordan but not for skilled jobs. Such methods increase the probability of obtaining less secured informal jobs. Also, the study shows that despite the importance of public sector agencies in the job search process, less than 5% in Algeria and 9% in Jordan of employed youth state that such agencies have helped them transit into employment. The fifth and last article underlines that Sustainable development consists of a long-term, integrated approach to develop and achieve a healthy community by jointly addressing economic, environmental, and social issues, whilst avoiding the over consumption of key natural resources for managers and government planners in public management. Therefore, this study aims to identify and rank the sustainable development components influencing and improving the development level of Sistan and Baluchestan province of Iran through using hierarchical analysis method (AHP) and Expert Choice software. The obtained results analyzed and ranked the factors using collected comments. Expert Choice software also indicated that the economic had the highest effect on improving the development level and the social and the environmental factors were the next priorities, respectively. The SESRIC with its JECD team shall continue to serve its readers by always selecting the best articles whose long-term profitable and constructive information shall be of use as well as serve the OIC countries’ best interests‚ upholding their willingness to contribute to the expansion of economic and technical cooperation among themselves and beyond.